When planning overseas trips we like to keep things really flexible and often will add destinations randomly if we have a layover there. On our way home from Sri Lanka we had a layover in Brussels and so we decided to spend a week in Europe. I had been to Brussels before, but not Paul and the kids and so we decided to visit Brussels and Brugge. The highlight was meeting up with our friends from Malaysia – Dianne, Rudy, Thijs, and Marith, who were home in the Netherlands for summer vacation. Paris is a special place for Paul and I because it is where we got engaged, way back in 2003. We had been back once, but thought it would be fun to visit with the kids for a few days. We got engaged at the Eiffel Tower and we have a really cute photo of us in front of the tower. We thought it would be fun to re-enact that photo, as our family of 5 now. We didn’t go up the Eiffel Tower, but we did go up the Arc de Triomphe. We enjoyed just hanging out at the parks around the city. I love Notre Dame and the surrounding area and taking the ferry along the Seine is a great way to view it. We found Paris a great city to hang out with the kids. We were only here one night but toured around the City and of course visited Mannekin Pis. 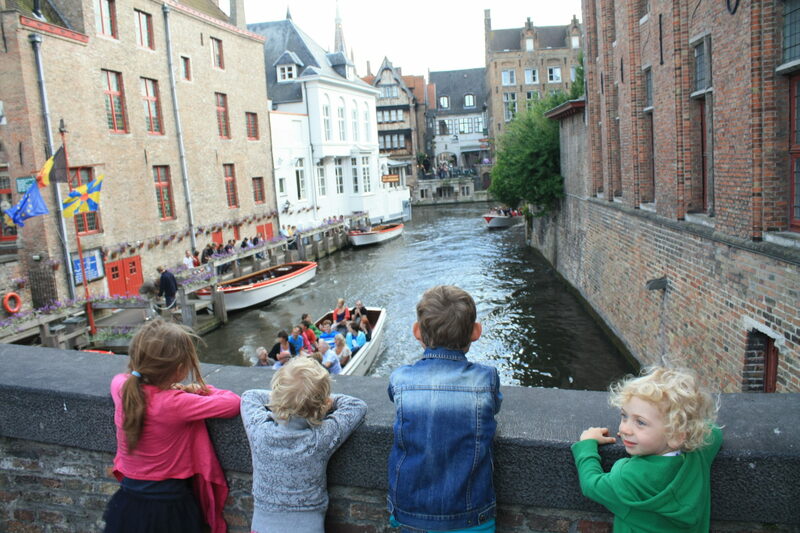 Brugge is touristy but it is touristy for a reason – a beautiful medieval town with canals throughout. 1 BR Apartment – rented from Home Away in the Latin Quarter. They even had a baby bed and it was great to have a kitchen and be in a real Paris neighborhood. We really struggled to find hotels that would allow our family of 5 in one room. The Novotel chain was a great find because they had family rooms and were moderately priced. Novotel Brussels off Grand Place – we paid 100E for a family room. Great location and nice room. Novotel Brugge Centrum – 100E for a family room. Another good find. We took the Thalys train between Brussels and Paris, which of course was fun for the kids. 1 1/2 hours. 45E/adults, 15E/kids. We flew home Business class, which is such a treat, that we will likely never experience again.